If you are interested in joining Sonoran Bells, becoming a substitute ringer, or in brushing up your ringing skills with one of our other groups (Cholla Chimers, Mesquite Ringers, Sonoran Bronze), please contact Shannon Casey, Artistic Director, for more information. 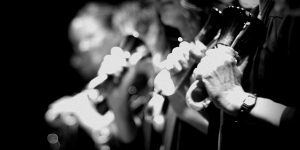 Membership is open to all persons who share the mission and goals of Sonoran Bells, pay annual dues and are approved by the Audition Review Committee through an audition and evaluation process. 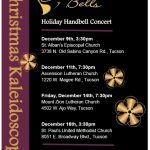 Good attendance is a high priority of Sonoran Bells. Rehearsals are held on Tuesdays from 6:30PM to 9:00PM. The group rehearses in a centrally-located Tucson location. Duties of the Members. . . . .
To take an active part in Sonoran Bells business by serving on a standing or ad hoc committee. To attend Sonoran Bells rehearsals and performances as required. To purchase performance attire as determined by the Executive Committee.